Working Group Plan for 4MRV heads to county. Panel discusses Four Mile Run Valley Framework for Area Plan and Park Master Plan. Photo by Shirley Ruhe. (Click on "Download .JPG" to see large map.) 4MRV Redevelopment Area. Portia Clark, president of the Nauck Civic Association. John Vihstadt, County Board representative to the 4MRV Working Group. A working group was established two years ago by the county to develop a policy framework for the 4MRV area. According to Robin Stombler, vice chair of the Four Mile Run Working Group, Nauck has been waiting for decades for a revitalization plan from for the area. Edith Wilson, chair of the Shirlington Civic Association, said, "This didn't begin in 2016 with the working group. We have a history of failed attempts and broken promises." Stombler said, "We recognized that Nauck was always put on the bottom rung by the county so we said if the county isn't going to do something, we are. Some of us sat around the kitchen counter — looked at drawings, did some research. We had a strong buy-in from Nauck. We had some important ideas reflecting Nauck's wants and needs but we had no illusions things would change." Their group grew larger and larger. Finally, in October 2015, the chair of the County Board said Nauck would be the first priority for 2016. "We thought finally Nauck is going to get its day," said Stombler. In January 2016 there was a launch party for the area with the County Board, U.S. Rep. Don Beyer, volunteers, and Nauck residents to describe the current conditions and vision for the future. They gathered at Arlington Food Assistance Center to move forward. "And then we were waiting until May when the county decided to put together a working group. And that's where we have been for the last two years." The working group has developed a framework that will be considered at a County Board meeting later in May. The next step is to prepare a draft Area Plan and Park Master Plan during the spring and summer of 2018. The framework was developed after 30 — at times acrimonious — meetings of the diverse working group to develop a plan that balanced often competing interests and diverse goals for the community. Stombler says the plan says almost nothing about Nauck “and that is troubling. The framework is silent on a number of issues we would like to see more detail on. It lacks creativity and an understanding of the neighborhood." Clark said, "All the neighborhoods, the sports interests and businesses all say what Nauck wants. The board gets input and then does what they want. The county is driving the plan to redo the park." Clark says what Nauck needs is economic development: "Young people are working paycheck to paycheck. They have no hope in the system." Clark says the character of Nauck is changing. The population used to be 80-90 percent African-American but that number has dropped to 36 percent. The change came as the population aged and the demographics shifted dramatically. Clark said, "There are a number of hidden pockets of poverty in the 22204 and 22206 zip codes” with elderly making up a lot of low-income residents. "Other [are] young women with children under five and if there is no husband to pay child support they are usually on welfare." A lot of men live in poverty because if they work, they get their money taken for child support. So they do pick-up jobs and dig themselves into a hole. One thing leads to another because, without a steady job, you can't apply for the few affordable housing unit available. The waiting list is always lengthy. Charles Meng, executive director & CEO of Arlington Food Assistance Center whose building is located in the Four Mile Run area, says Nauck is coming under a lot of pressure due to development. "I really think that Arlington has to look at what it is doing to maintain the diversity of this county because as land prices go up and gentrification continues the diversity Arlington is so proud of will soon be gone." Clark says the county wanted to change the industrial area but the citizens like it for incubator business and it could help to create much needed jobs. Stombler echoes this comment: "This is a light industrial area, the last vestige of industrial in Arlington. and we would like the character to remain. There are a lot of ways to keep the industrial presence but to incorporate different uses like an apprenticeship program. This is already happening with the arts, and we already have a lot of arts here that people don’t know about, like a black box theatre and a sound studio, but it needs to be revitalized. We want it for the community." It has been a long and winding road to get to the proposed policy plan and framework for Four Mile Run Valley (4MRV). The valley is one of Arlington's last unplanned areas. It is an area of diverse interests including Jennie Dean Park, industrial businesses, arts groups, the largest dog park, Four Mile Run and the Nauck neighborhood which is an African-American community predating the Civil War. It is located between Nauck and Shirlington. The plan was laid out at the Arlington Committee of 100 informational meeting on May 9 with various interests presenting their points of view. Chikwe Njoku, project coordinator and division chief with Arlington Department of Community Planning and Housing & Development, gave a presentation on the proposed framework for development of 4MRV. He laid out key themes including public access to the run, development of the arts district, reflection of industrial character, and maintaining cultural heritage of Nauck. Key challenges include the level of development, two-block arts/industrial area, presence of existing businesses, parks and bikes/pedestrian safety, environmental stewardship, Shirlington Dog Park and the configuration of Jennie Dean Park. John Vihstadt, County Board representative to the 4MRV Working Group, said, "The process has been a bit bumpy. There were a lot of interests who naturally feel strongly that their uses be protected." The competing interests were reflected in the discussions that followed, with a key bone of contention being the future of Jennie Dean Park. 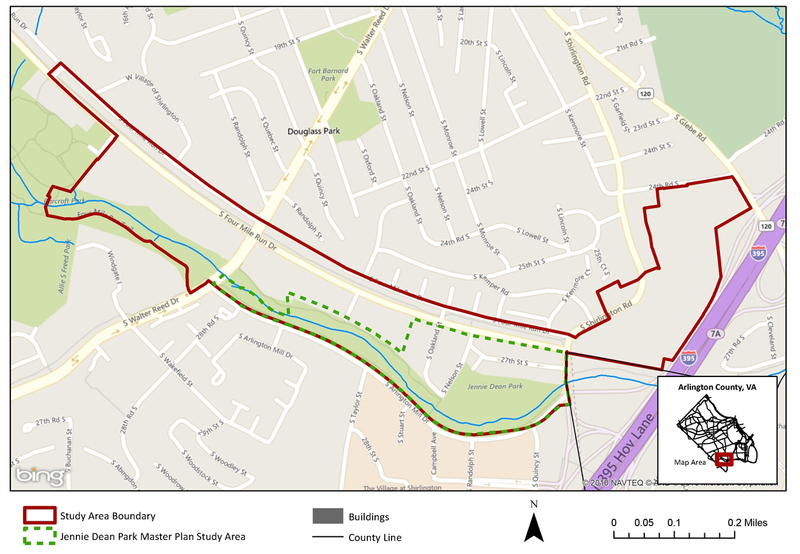 Option 1 for the park is recommended by the Shirlington Community who live outside the study area but they point out Jennie Dean Park is on the border line with Shirlington. Edith Wilson, president of the Shirlington Civic Association, says they have no parks or playgrounds and that all the residents live in multifamily housing with no yards of their own. "We depend on it." She adds that Option 1 does not require the uncertain purchase of the current WETA building. She says they support Option 1 because the playground is closer and more accessible to Shirlington residents who come over the footbridge and also the design is less awkward. She says Arlington parks are for everyone, and the community needs of all the neighborhoods surrounding the valley master plan area should be considered. However, the Nauck community prefers Option 2 that places the adult ballpark on the other side of the park with the accompanying lights and noise that would be objectionable to Nauck residents. They live just across the street on South Four Mile Run. Option 2 depends on county purchase of the WETA building but includes more green space and less disruption for Nauck residents. Njoku’s presentation was followed by short discussions by Arlingtonians with various interests in the community. Mike Katrivanos is the owner of a brewery in Arlington. He painted a positive picture for business: "The outlook in the valley is good. You always hear about vacancy rates but office vacancy rates in the valley are single digit, and average turnover is low. A business is usually there 10-20 years. The valley is a little bit of a different animal. I am a Nauck resident and it is a pleasure to walk to work." He says he cherishes the sense of camaraderie and the vibe in the valley." Edith Wilson, representing Shirlington, points out the process didn't begin in 2016. It was always stricken from the county's list because there was something more exciting." She said finally Shirlington and Nauck said: "Time's up. We need a plan that is fundable." Wilson added that Shirlington supports Option 1 for Jennie Dean Park because “it can be built the soonest and is the fairest. This should be a park for the community. We should honor the past but prepare for the future." Caroline Haynes, representing the parks, says people take their parks very seriously and the discussions have been very complicated with split votes on the proposals. “There is a separate committee on parks. We will see more on that. It is time to get going on this and no one will get everything they want." Portia Clark representing Nauck, the historically African-American part of Arlington, said, "There are elements that align with our vision but there is no plan for economic development and it is silent on the future of property. There is little mention of the needs of Nauck in the plan. While there are two options for Jennie Dean Park, neither completely reflects our goals. Number 2 option is better because it places the ballpark with the noise and lights on the other side of the park and makes the green space more accessible. We welcome change but not at the expense of our values. We will not stand for making Nauck invisible." Which of the options for Jennie Dean Park has more environmental? What are the issues with purchase of the current WETA building? There was no mention whatsoever of affordable housing; why is that? You tried to squeeze it all in. Don't we need more land to do all the things we need to do? Don't you agree Nauck has been there longer and should have greater weight? The final question summed up the framework. "Do you think your concerns were adequately addressed? Ten seconds each." Business: Did the best they could under the circumstances. Business was told they could stay but lost a lane. Shirlington: Having a new park is a plus but get rid of buses. Sports: Mixed bag. Don't know what the replacement will look like and no expansion. Nauck: Loss unless we get option 2. Arts community: We get it but not enough land. The County Board is scheduled to consider the adoption of the Policy Framework later in May. Vihstadt said, "This was complicated because we did an area plan and park plan together. It involved the community planning, housing, transportation, economic development all involved at the same time. The county has silos. It has forced the county to talk to each other in a holistic fashion. I think the framework is the first concrete step and I could imagine that between 2019-21 we could see the design, construction and building. We have to make some difficult budget choices but I am confident we will do Jennie Dean justice. I think ultimately this process will be considered a success." Hidden Valley: Long neglected Four Mile Run reimagined and redeveloped.